I don’t listen to much mainstream chart ‘pop’ music anymore, and I suppose that which I do listen to often I consider a guilty pleasure in a sense. That’s never really been the case with Nina Nesbitt, and her debut full-length is surprisingly accessible when taken for what it is, offering a little more than just a standard mainstream pop record. After building a reputation for herself on the back of a string of successful EP’s and strong live performances she’s one of the main rising stars to watch this year, and Peroxide ensures that she’ll remain so. 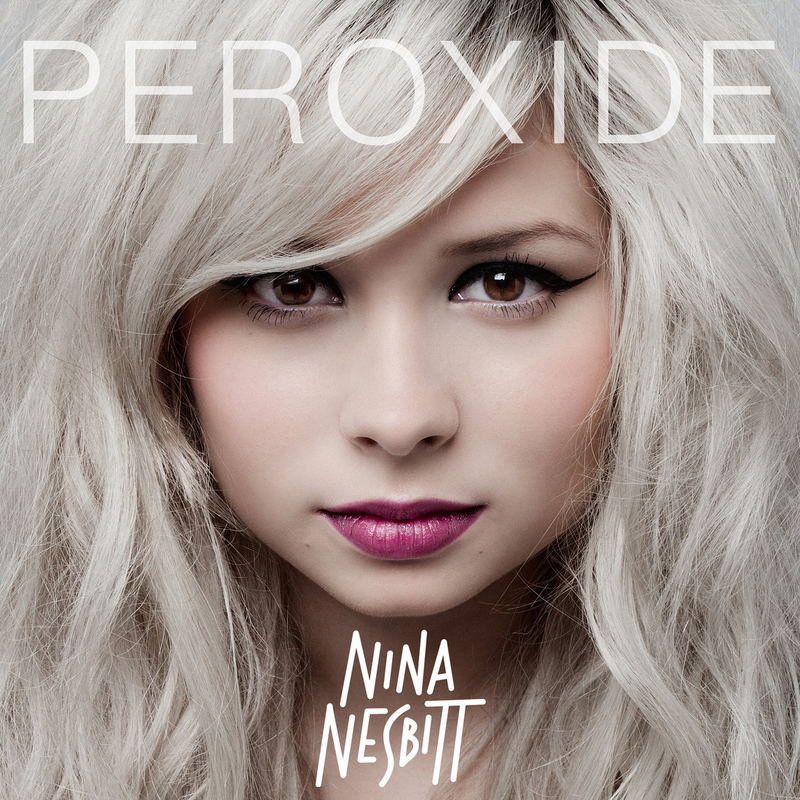 Peroxide is a varied and generous bag, throwing in poignant ballads with dynamic and catchy pop songs. There are elements of Taylor Swift in the rocky acoustic title track which starts the album in expectedly delightful fashion, and Peroxide sets the tone for what’s to follow, pairing Nesbitt’s lyrics with upbeat instrumentals – similarly to sixth track Mr C which is another unashamedly poppy number. There’s a strong acoustic backbone to Peroxide but it’s not afraid to branch out, with tracks like He’s The One I’m Bringing Back opting for a retro dance feel, whilst 18 Candles is a bit more ambitious, strutting along in an almost bluesy fashion. Tracks like these definitely separate Nina Nesbitt from the crowd, and do so without breaking the formula too much. Production comes partly from Jake Gosling, who’s worked with the likes of Ed Sheeran on his debut release + and his production is great, throwing in some rockier elements (Tough Luck) amongst shining pop songs and emotional ballads, all of which glow with a charm that comes mostly from Nesbitt herself. Vocals are great, with her strong delivery aided by both her accent and her attention to detail when it comes to expressing herself. In both the more sentimental moments and the quirkier upbeat numbers she rises to the occasion, and her delivery is always memorable. Lyrically however, the album falls a little flat, considering she’s only 19 it’s understandable to have songs about selfies and teenage love, and for the most part they are covered in a way that stays clear of cheesy clichés that paint pictures of late night walks home and holding hands on the bus. The more mature tracks are where Peroxide really comes good, and Nesbitt definitely paints herself as a varied artist intent on doing things her own way, be it through the faster guitars and singsong vocals of the opener or the reflective ballad Two Worlds Way. Fair enough, you’ve heard similar songs before but she makes them good enough to hear again and again, taking a different approach to what’s expected. Unlike the previously mentioned + only two tracks from Nesbitt’s past releases feature, and these tracks are Stay Out and Hold You, which features Kodaline and makes for a very nice touch that gives it a clear edge over The Apple Tree’s original version. Stay Out is an excellent feel good pop song and social commentary, opening with the line ‘He’s got a Rolling Stones tee but he only knows one song / They think they’re from the sixties but they were born in 1991.’ It’s a track that’s easy to relate to and agree with, and it differs from a lot of what occupies the charts. Maybe it’s the acoustic backbone or the wit it’s told with but it offers a lot more, with Nesbitt asserting herself as an honest and charismatic individual. It’s a fitting single, and one that shows her more playful side, with following track Selfies doing much of the same, with a sunshine chorus and lyrics that fit its title. Eleventh track Hold You is a contrast, favouring a bittersweet nostalgia as opposed to teenage extravagance. It’s a touching track, and these more mature performances paint Nesbitt in the best light musically, casting her as older as and wiser than her age suggests. It adds a dimension that releases of this nature often lack, and it’s refreshing to see so many of these types of track feature. I’ve always preferred the more ballad styled songs that she’s capable of delivering, as she did so well with Babylon and Skeletons on 2011’s Live Take EP, and the album features a few of that calibre (Two Worlds Away, Align, Hold You, The Hardest Part) and this side of the album is much more engaging. Closer The Hardest Part is the standout selection from the above, ending the album on a fittingly emotional note as Nesbitt smolders over delicate acoustic guitars as she looks back on an ended relationship, with her vocals sparking and breathing life into some of the more personal lyrics (‘I’d give anything just to be with you again, but it’s not the right time’). It’s a great finale, and reminds an audience just how much she has to offer, in every aspect of her music. Peroxide will be a success, and it will be for the right reasons. It keeps the more cringe worthy elements of pop music to a minimum and replaces them with a charm that carries the album for its entirety, remaining sweet but not sickly so. Long term fans will be happy with the mix and progression whilst newer fans will undoubtedly find an equal amount to love. It’s hard to take it as a debut album considering her back catalogue but Peroxide is a great debut, but is also let down by a few weaker tracks. It also suggests that maybe Nina Nesbitt still has a bit more growing up to do, and in doing so the only way can be up, and probably will be.